I was introduced to the Fourier transform and series at the age of 19, and the first thing I thought was, "hey, this can be used for the 3d camera movements in my demos". Originally I was more into regular demo making instead of procedural generation and compression, so at that time I wanted to use the new toy of Fourier for key frame interpolation, I didn't think of compression. Despite my enthusiasm, my teacher didn't show much interest about the topic of interpolation. 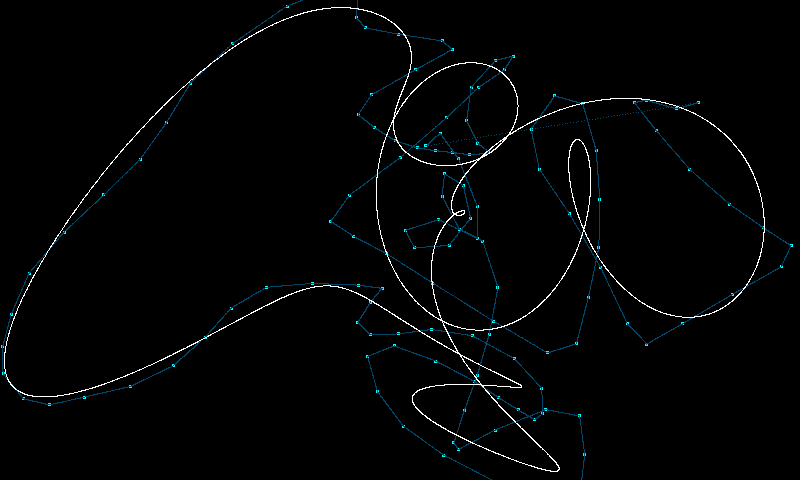 Still I programmed it (results down there) but never used it in any demo because splines were cooler then. Anyways, here it goes (much blah blah and little code this time, sorry, I wrote this back then). where the values are called the "coordinates" of the vector f in the new system. So, computing the coordinates of f is as simple as doing a dot product between the vector and the axes of the new coordouinate system (well, their conjugate if they are complex). Just as in regular geometric vector spaces (ie, we are just applying a rotation matrix to our vector f). Memory refreshed? Ok, let's go on. Now, by rotating the vector f by the matrix we have transformed its representation, ie, now it's what we have to store in our demo, not f anymore. As we said, the higher order axes represent the detail structure of f, while the global structure of f gets mostly projected into the lower order axes. Assuming f will represent real world data, like camera movements or shapes, it will probably be quite ok if we only pay attention to its global shape, and we discard the rest of the information (for efficient storage and compression purposes). That means we only need to store few of the coordinates . That's what JPJ images or MP3 music do, so it should work for our camera paths too. So I quickly coded a proof of concept. I generated a random two dimensional set of 50 points. Then I computed two Fourier series, one for the x coordinate and another for the y. Each of the Fourier series gives 50 coefficients of course. 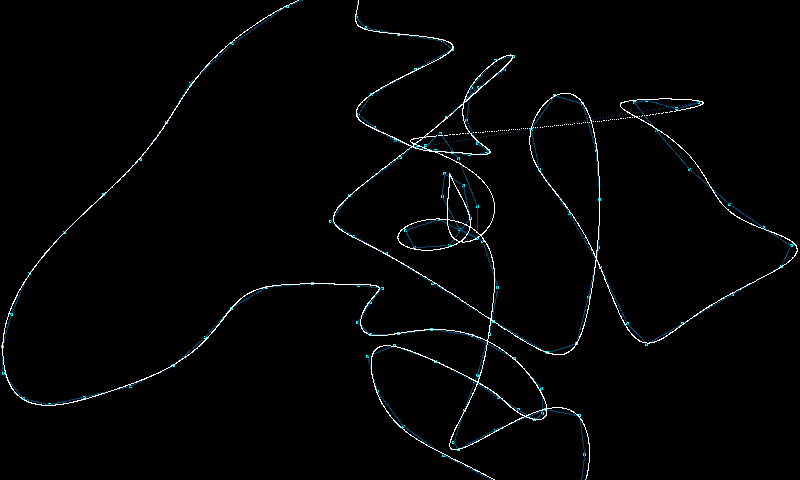 When using all of them to reconstruct a signal the resulting path exactly passes through the 50 points. Perfect! That's a good way to do camera interpolation (think of the 50 points as key frames). Results are not as bad as you would expect, because even the full set of 50 coefficients is very easily compressible, much more than the original description of f. For example, since we know that the last coordinates are going to be smaller than the first, you can actually use less bits for those. Well, there many such tricks, just have a look to the JPEG specification for more inspiration. 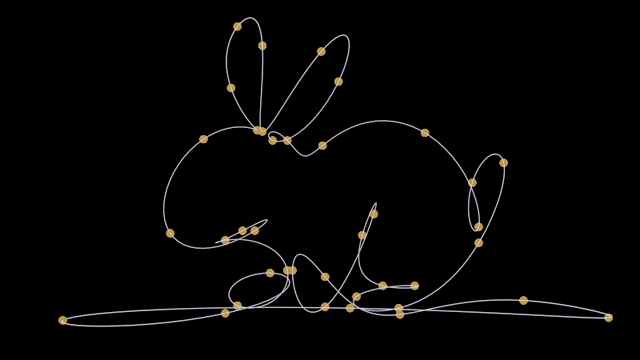 This live example in Shadertoy shows the approximation of a shape by an increasing number of Fourier coefficients: https://www.shadertoy.com/view/ltKSWDM.